Watch video below, click arrow. NEW YORK -- LaDonna Brave Bull Allard, Lakota of Standing Rock, urged the United Nations to immediately halt the Dakota Access Pipeline and demanded immediate assistance for Dakota, Lakota and Nakota. 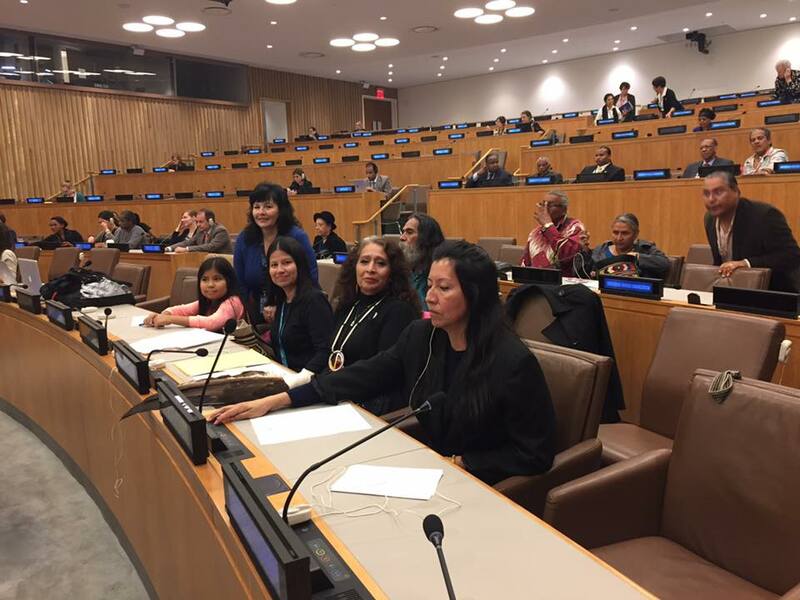 Allard addressed the U.N. General Assembly during a briefing today on Indigenous Issues. Allard began her address by stressing the need for consultation and described how it is vital for the well being of Indigenous Nations. 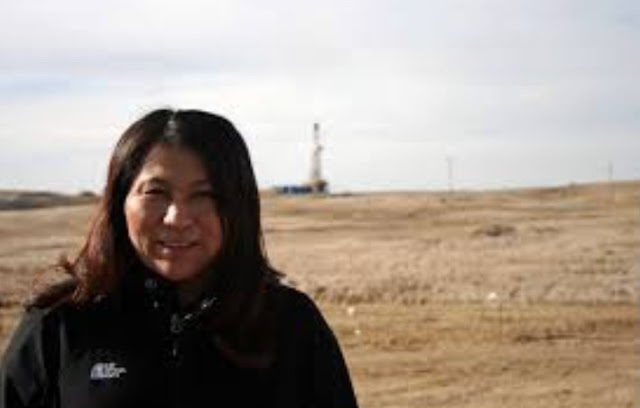 Allard said the Dakota Access Pipeline is flagrantly violating the Universal Declaration of Human Rights, United Nations Declaration on the Rights of Indigenous Peoples, the Fort Laramie Treaty of 1868, unresolved Indian Land Claims and most important of our Mother Earth. The people of Standing Rock are invoking the Universal Declaration of Human Rights, Declaration on the Rights of Indigenous Peoples, and other U.N. laws, to halt this pipeline. Allard denounced the ongoing terrorism against Indigenous People by the TransNational corporations at Standing Rock, in the Amazon and elsewhere. She said Indigenous Peoples are protecting life on earth and clean water for future generations, so that all life can continue to exist. Indigenous traditional knowledge is the only path remaining that can heal the ongoing destruction of consumption. Without traditional Indigenous knowledge, the path will be one of destruction. She urged unity to protect the water, and demanded that the United Nations intervene and immediately stop the Dakota Access Pipeline. "We must unite to protect the water and our Mother Earth." Watch the video above, and read statement below, for her full comments. I greet you with a good heart today. 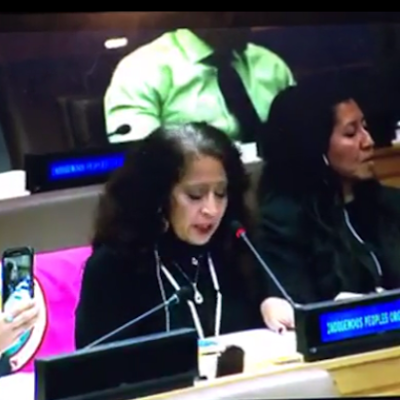 I am Ta Maka Waste Win, an enrolled member of the Standing Rock Sioux Tribe I am speaking regarding the participation of the over 300 million Indigenous Peoples of Unci Maka Mother Earth. Within the United Nations system, we the Indigenous peoples request that our participation be granted at the highest possible level and that our representatives be legitimate and elected by Indigenous Nations and organizations in each region. This will secure that our participation and contributions on issues that affect us are addressed in a legitimate manner. Lack of this legitimate representation and contributions on issues that affect us are resulting in violations of our equal and inalienable rights as members of the human family. As such is the current and urgent situation of the Standing Rock Sioux Tribe, my home, where the Dakota Access Pipeline has blatantly violated the Universal Declaration of Human Rights, the United Nations Declaration on the rights of Indigenous Peoples, ILO 169, the Laramie Treaty of 1868, unresolved Ihunktonwana Land Claim Docket 74A and most importantly our Mother Earth. The organization hereby invokes the Universal Declaration of Human Rights, the United Nations Declaration on the rights of Indigenous Peoples, ILO 169 to be enforced and brought to life to put an immediate stop to the Dakota Access Pipeline. We request that an observer and media team be sent immediately and permanently to Standing Rock until this issue is resolved to protect the water. This situation with Dakota Access has been going on for 6 months now. It has endured Spring, Summer, Fall and heads into Winter as we protect and defend our right to water. We demand immediate assistance and protection for our Lakota, Dakota, and Nakota sisters and brothers. Today we are here to formally denounce terrorism from transnationals agaisnt Indigenous Peoples of Mother Earth, as such is our situation in Standing Rock and also the urgent situation of our Indigenous sisters and brothers in the Amazon and many other parts of the world. The organization remains committed to solving the challenges faced by our generation which is to protect life and clean water for the future generations and so that all that exists can continue to exist. The Indigenous Traditional Knowledge is the only path remaining to heal the unsustainable pattern of production and consumption that is destroying our lives and the world around us. Agenda 2030, without our legitimate representatives and inclusion of Indigenous Peoples Traditional Knowledge will fail. Our knowledge can help heal Mother Earth. Without it, great and irreparable damage will lead us to destruction. We must unite to protect the Water and our Mother Earth. We, the Indigenous Peoples of Mother Earth walk to the future in the footprints of our ancestors.